Sherlyn plans to take down Preeta's good reputation, while Prithvi is out to protect Preeta's honour. 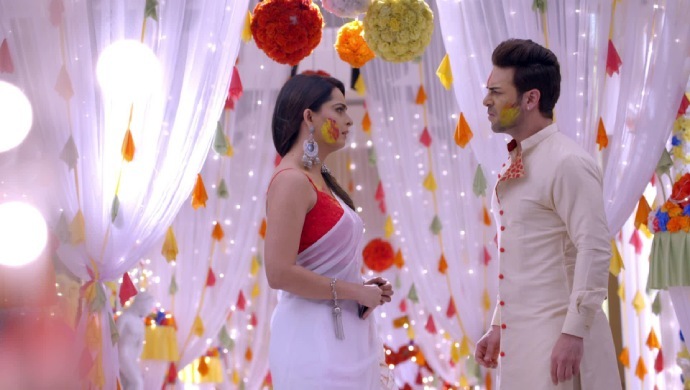 In the previous episode of Kundali Bhagya, Prithvi tries his level best to spend time with his future wife Preeta on Holi. Rishabh keeps Preeta protected from Prithvi, around whom she feels uncomfortable. Sherlyn is trying to ruin the good reputation Preeta has in the Luthra household and has a plan for it. Monisha throws a knife at Rishabh giving him a deep cut Preeta tries to heal his wounds. In tonight’s episode, Preeta gives an injection to Rishabh who is terrified of injections. However when Preeta gives him an injection he doesn’t even feel the pain. While Preeta is helping out Rishabh, Prithvi is looking for Sherlyn. When he finds her, he scolds her for not being with Rishabh when he needs her. Sherlyn tells him that she is trying to expose Preeta’s gameplan. She believes Preeta is being nice to all the men in the Luthra household because she wants them all to run around her and be the centre of attention. Prithvi stands up to defend Preeta in her absence. Sherlyn threatens him to stop talking to her disrespectfully or else once she gets married to Rishabh she will cancel Prithvi’s engagement to Preeta. This scares Prithvi and he realizes Sherlyn has an upper hand on him. He asks her to at least be near Rishabh when he is injured. Sherlyn goes in Rishabh’s room to tell him that she has called for a doctor. She finds out that Preeta has already done half the work. She is enraged that a physiotherapist is doing a doctor’s job and asks Preeta to not interfere anymore till the real doctors come. Rishabh scolds Sherlyn for speaking in that tone to Preeta. Prithvi has to step in and calm the scene. He demands that Sherlyn apologise to his future-wife Preeta for insulting her. Sherlyn is shocked at hearing Prithvi’s demand but ends up apologizing. Sherlyn then meets Preeta outside the room and tells her to stay away from Rishabh whom she’s going to marry. Preeta tells Sherlyn that it sounds like she’s scared of her secret coming out and that fear is good. Then she leaves to get a glass of haldi milk for Rishabh. In the kitchen Monisha is hiding waiting for her next chance to strike. When she hears that Preeta wants a glass of milk for Rishabh, she goes out to poison the glass. However, she is sighted by Rakhi who immediately recognizes her. Will Rakhi be able to save Preeta and Rishabh from Monisha? Stay tuned to find out.